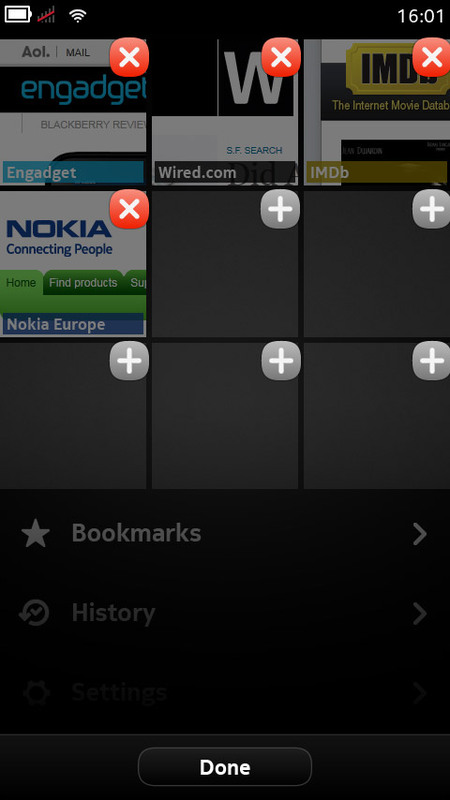 Web Browser of Today | Maemo UI improvements blog. Today I’d like to discuss an app that we’re using probably every day on our smartphones but each time it feels underrated — the built-in web browser. The problem is that the Maemo browser has been facing functional devolution year after year. But the web has been changing constantly as well as our lifestyle so now we need a proper tool to view the Internet in the right way more than ever. So here are my thoughts on what should be changed in the default web browser in Harmattan. Many of those features you maybe have already seen in different apps so basically I’m just making up the concept out of existing pieces. So first of all I’d add the grid view to the home screen of the browser that has been introduced by Opera under the “Speed Dial” name and then used by many other modern desktop browsers. A quick and easy way to jump right to your favorite bookmarks. As I nice bonus I’ve added user-adjustable color tags for labels so your eyes will catch the bookmark you need even faster. Along with the Grid itself you can also find a shortcuts to all necessary browsing stuff like bookmarks, history and settings. Also you can just type the address or search query on the bottom. To manage the Grid you can simply tap’n’hold on any of the squares, just like you do in the apps menu.It will allow you to add new bookmarks or delete or relocate existing. Let’s move on to the other important feature of any web browser – bookmarks management. It’s nice to have the Grid view or even a shortcut right in the apps menu, but what if you have just too many bookmarks for such simple interfaces? That’s why we need something more sophisticated. 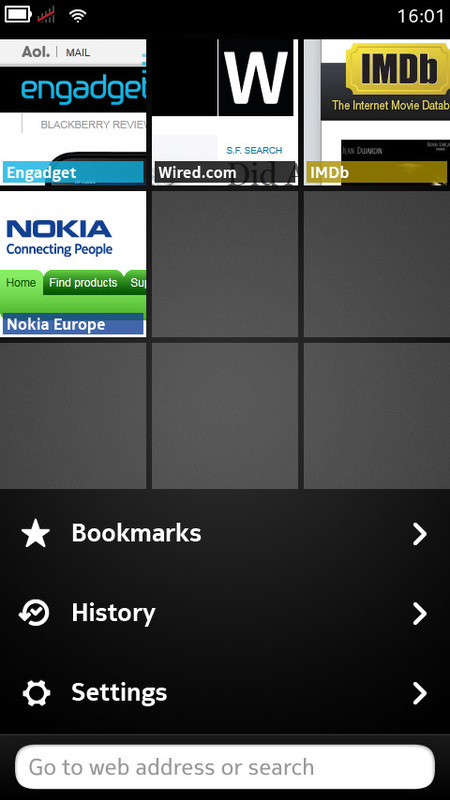 As you can see, now we have good old detailed view of all bookmarks you have no matter where they are located. 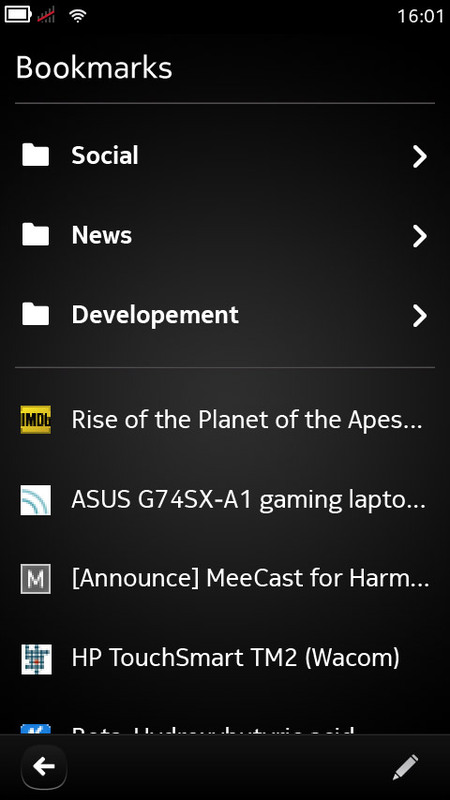 Just tap edit to create new folders or delete existing items. Also notice that now we’re using favicons instead of almost useless tiny snapshots of pages for even easier navigation.And of course there is a “pull down to search” feature just like in any other place in the system (Harmattan) if you know what you’re looking for. “Add bookmark” dialog has been modified too. Now you have a bunch of options for this action. Along with label you can change the target folder to any you want. Also you can chose whether you want to add the bookmark to the apps menu and/or Grid view. And the third option that needs some extra explanation. Basically it’s the mode where your web page loads without any “browsing” attributes like address bar, back/forward buttons or anything else, just simply fullscreen. It will finally open the door to proper mobile web applications with their own navigation, advanced caching and many other things. Just imagine one single multi-platform application that looks the same on any device (of the same category of course). Since we’ve revamped bookmarks I don’t have any reason not to improve history list. Favicons for easier navigation, quick scrolling between time intervals, handy way to quickly clear the list without drilling down the menus. Now I want to ask you, what other features do you need in your mobile browser? Desktop sync? Fit to screen mode? Unicorns? Please feel free to share your thoughts here and who knows maybe one day developers will read this stuff and use these advices. I hate “the grid”, and normal bookmarks and history don’t make real sense for me on the phone – but I could not live without the “awesomebar” and Firefox Sync. 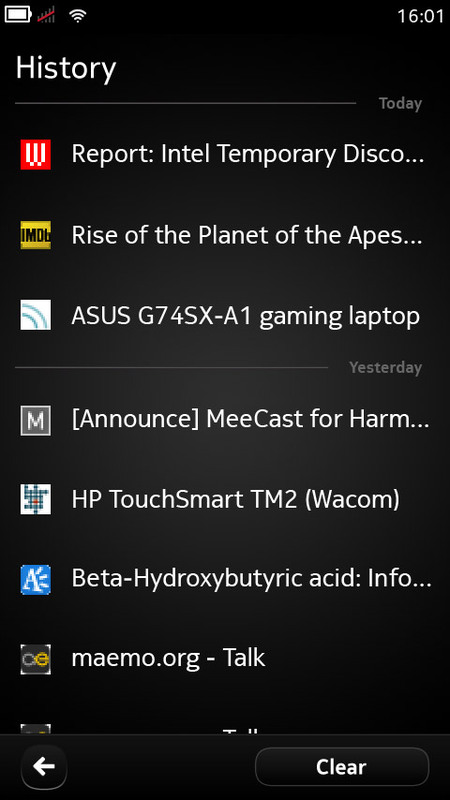 How would you sync yourdesktop bookmarks and history without proper management on the smartphone? I said _normal_ history and bookmarks, long mostly static lists of stuff, those don’t work well on small screens. And the “awesomebar” of Firefox mobile gives me easy access to all of thosewith typing a few letters contained in an entry. i like this, i like it alot. Harmattan’s browser is cutting-edge, it’s not even released with the N9 yet. Well, according to my experience Harmattan’s browser is just an “awesome-bar” with no additional options. Maybe I’m terribly wrong, do you have any link to some additional info? 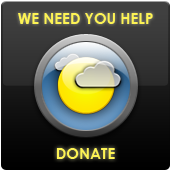 “The problem is that the Maemo browser has been facing functional devolution year after year. Whatever do you mean? It’s totally different browser in harmattan compared to the one in fremantle. Yes MicroB hasn’t been evolving, but the one in harmattan of course has/is been/being actively dev’d. Of course it’s not the kitchen-sink type browser like Fennec, that’s not how it’s geared. There was an excellent article, can’t find the freaking thing now, if I CBF’d looking for it & find it, I’ll link to it. Well, maybe it has been activly developed in terms of internals, but speaking of UI and UX – functionality has been reduced greatly. If that was your main point, then you may be right. I’m yet to have one in my hand, so I can’t compare it to my N900’s MicroB. Def. some impressive stuff under the hood though. Still can’t find that article, was very in-depth/informative. Man, I really have missed being here. Nice topic, but I don’t know if it goes far enough. Browsing on a mobile needs a bit more. For example, where is the built in browser support for micro formats? Given that many times, a browser is evoked and then another action needs to be done (sending links, copying into another applicaiton, etc), the browser on a mobile should make that a lot easier. I am of the impression that the text reflow needs some work? That would probably be a sticky, but point to something bigger, like a more appropriate zoom, or even a spatial zoom/panning feature for some pages. I would personally like to have an option where passwords aren’t hidden as you type them. You are on a mobile device, hiding on such a small and non-shared screen doesn’t make sense. Just like the grid for bookmarks or a landing page, having one for multiple “tabs” makes sense here. Stopping now. I really need to get my hands on an N9 and live with it a month to see where any other usability or functionality quirks lie. There was some text re-flow improvements with PR1.1, more to come in 1.2. 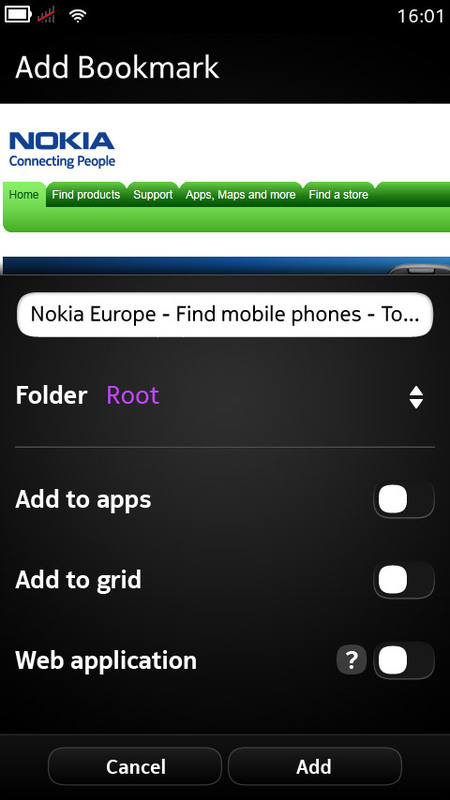 I would like the web application feature you have there, otherwise I don’t really need anything else for the N9 browser. Bookmarks in its current form is good enough for me when there is folder support or have it implemented to the browser (small icon, grid or list). Imo there should be a more efficient way to surf between those web windows, the current method is a bit messy. There was an idea somewhere that to have a webpage title in the middle of the window, this would help alot. If you think you have some fairly simple/elegant ideas to improve functionality in the browser or elsewhere. If you get enough people interested & voting on the concept, they may cherry pick it.